Custom designed for your precious Fitbit Alta / Fitbit Alta HR Smart Fitness Tracker, this MoKo Noble Stainless Steel Fitbit Alta Watch Band features a combination of functionality and style. Fits 5.51"-8.46" (140mm-215mm) wrist. Adjustable design allow you adjust the bands length freely. * Band comes with Fitbit Alta / Fitbit Alta HR Watch Lugs on both ends, which locks onto Fitbit Alta Watch Band Interface precisely and securely. Easy and direct installation and removal. 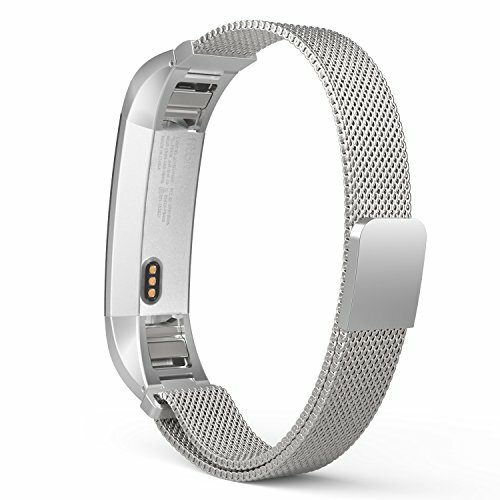 Flexible stainless steel mesh with adjustable Milanese Loop for comfortable day to day wear. Fits 5.51"-8.46" (140mm-215mm) wrist. Personalized Your Fitbit Alta / Fitbit Alta HR Smart Fitness Tracker with this refined replacement stainless steel wrist band with Milanese loop. Band comes with Fitbit Alta / Fitbit Alta HRWatch Lugs on both ends, which locks onto Fitbit Alta / Fitbit Alta HR Watch Band Interface precisely and securely. Easy and direct installation and removal.